One of the most iconic computers in cinema is certainly HAL9000 from Stanley Kubrick’s epos 2001: A Space Odyssey. With all inner workings hidden beneath a red light in a camera lens, the mischievous A.I. created an eerie atmosphere just because it had no tangible interface to control it. Today we are moving towards a world of such interfaces. 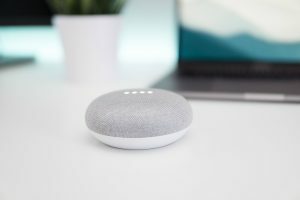 With eavesdropping virtual assistants such as Amazon’s Alexa or Google Assistant, Voice-User Interfaces (VUI) have become powerful enough to regulate a wide array of consumer tasks. But this is just one particular technology inside a much bigger upcoming digital media trend: The Zero UI. Andy Goodman of Fjord design agency explains Zero UI as a new interface design paradigm that seeks to leave the computer screen as primary way of interaction behind (qtd. in Brownlee). Instead of watching and touching displays, interactions ought to work in more natural ways like voice control, haptics and gestures. These will become dynamic controls as systems are being empowered with technologies like computer vision and machine learning. Zero UI is an approach to a technological future in which we aren’t stuck on our screens all the time. The Fjord team’s optimism goes so far as to claim that social interactions could even become more natural again – because their mediation though devices will be less obvious. This shall extend to not just devices, but to “homes, entire cities, even environments and ecosystems, and as a result have a massive impact on society as a whole” (Lundquist). Goodman sees Zero UI as the next step in a history of evermore intuitive computer interfaces (Brownlee). The first machines humans could interact with demanded thorough understanding of their complexity and abstract logic. Humans had to adapt to the machine’s language. Now, Zero UI seeks to make machines speak the language of humans. Interfaces should therefore be minimal, ambient, invisible. I would like to explore this concept through the example of a Zero UI music player. 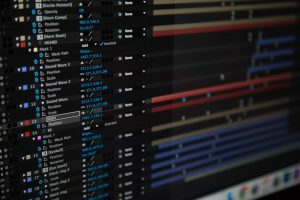 This is a particular idea in the field of music streaming platforms that employ data-fuelled predictive algorithms to recommend new music to their users. While this might not be an obvious application, it is certainly interesting: A music app that always plays the right song for you poses a relatable illustration of the complexity in Zero UI. Paul Lamere of The Echo Nest, a data analytics company acquired by Spotify, argued: “The ideal music player has zero buttons” (qtd. in Prey, “Knowing Me, Knowing You” 16). It automatically plays the perfect song in whatever situation you may find yourself: in the car, in the subway, at home – alone or in company. Obviously, the device’s ability to understand the current context is key here. That is why this idea is only possible after collecting excessive amounts of user data and achieving the so called “contextual turn” (Prey, “Knowing Me, Knowing You” 15): The realization that recommender systems predicting people’s desires should not regard these as static, but as context-sensitive. Personalization needs to account for the different moods, states and situations persons go through in their day. As for the data, Spotify collects sumptuous amounts about user interactions and listening behaviors in order to predict the user’s taste and situation (Prey, “Musica Analytica”). The contextual turn had Lamere arguing in 2015 that context is the new genre, as playlists and other curative products are increasingly targeted at situations such as Party, Roadtrip and Workout, rather than genres (Prey, “Knowing Me, Knowing You” 16). With personalization and prediction being central to the platform’s technology and the introduction of voice assistants instructed by users to play appealing music, it is time to raise the bar for context-aware recommender systems. What Lamere calls the Zero UI project encompasses the enormous challenges to create a predictive music player able to pick the perfect next song for you without the need to press a button (Lamere). This requires a lot more information than platforms gather simply from their user’s listening behavior. It demands implicit signals from the user’s whole media environment: Data from connected social media platforms, tracking data, and the whole data cosmos available through the user’s phone containing locations, movements, calendars, messages, and much more. Indeed, Zero UI requires an interconnected media ecology and is thus an interface of the Internet of Things (IoT). Let us look at this interface (or the absence thereof) through affordance theory. It seemingly affords comfortable, non-interactive music listening, but demands a vast amount of context data to do a decent job (Davis and Chouinard 243). Furthermore, the Zero UI discourages user interference and requests devotion to the algorithm’s selection. Even though that is probably what a user (or a manufacturer) of this device wants, something seems strange about it. James J. Gibson’s first account of affordances related to the visibility of surfaces: “To perceive them, is to perceive what they afford” (127). The concealment of the interface hides indications of its affordances and might remove the user’s awareness of his interactive options. It also blurs the subject-object distinction. The user might ultimately experience the music playlist as a reflection of himself, even though he does not know a single song in it. Will he, after getting used to it, even make a difference between the algorithm’s selection and his own taste? Marshall McLuhan, according to Neil Postman, thought “that it was better for people if the media they used promoted a balance in their sensorium” (13). Zero UI might positively impact that balance, as visual stimuli and active interactions get reduced. Man might externalize music or technology interactions into his media environment and render them a passive task. The question this summons though is, does he not gradually give up control this way? It should be noted that Goodman and other proponents have stated they do not actually take Zero UI literally, but mere as a “provocation” (Brownlee). Zero UI does not seek to diminish user control; it is just supposed to happen more “intuitively”. But displacing it to intuitive levels means it requires less conscious awareness of the interface, so there are less incentives to engage with the machine’s complex functionality. The discouragement of imposing power on the machine shifts power to the machine. While this doesn’t seem too critical on a music player, it can certainly be if taken to a news feed or search engine. If you do not control the news feed (or rather: if you are not aware how you control the news feed), it controls you. So the issue of control really depends on how the intuitiveness relates to awareness. If a Zero UI world would derive us of conscious control, Neil Postman would probably not have been too keen on its humanistic aspects. Davis, Jenny L. and James B. Chouinard. “Theorizing Affordances: From Request to Refuse.” Bulletin of Science, Technology & Society, 36(4), SAGE 2016, p. 241-148. Lamere, Paul. “The Zero Button Music Player” Music Machinery, 1.2014, www.musicmachinery.com/2014/01/14/the-zero-button-music-player-2/. Accessed 22.9.2018. Lundquist, Danielle. “Zero UI And Our Screen-less Future.” Fjord, 25.6.2015, fjordnet.com/conversations/zero-ui-and-our-screen-less-future/. Accessed 22.9.2018. Postman, Neil. “The Humanism of Media Ecology” Proceedings of the Media Ecology Association, 1, 2000. Prey, Robert. “Musica Analytica: The Datafication of Listening.” Networked Music Cultures. Pop Music, Culture and Identity, edited by R. Nowak and A. Whelan, Palgrave Macmillan, 2016, p. 31-48. Prey, Robert. “Knowing Me, Knowing You: Datafication on Music Streaming Platforms.” Musik und Big Data, edited by M. Ahlers, L. Grünewald-Schukalla, M. Lücke, & M. Rauch, Springer VS, 2018.